Update: It seems like Microsoft is listening to all your forlorn pleas for that white Xbox One. Reddit user KillerBYTE asked if there would ever be a white console sold to the public and surprisingly Major Nelson responded with "maybe waaaay in the future." This is awesome news because it tells us two things - one, the white Xbox One probably exists for those lucky employees, and two, there's hope for us yet as we might see a white box next year (or later but it's better than never). 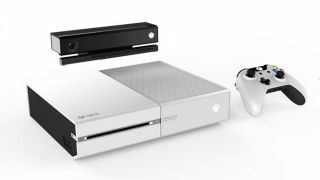 It seems like the Xbox One is coming out in white ... but you won't be able to get your hands on one unless you work for Microsoft. A Reddit user recently posted a photo of a white and silvery console saying his friend works on the Xbox team and will be gifted with a special Xbox One. A white controller and black Kinect with white tones are also featured. According to the image, the gift will come packed with one year of Xbox Live and "all 1P games" at no additional cost. The console also has "I made this" etched on the front for extra special bragging rights. TechRadar asked Microsoft to confirm the exclusive gift, but the company only replied with a cryptic "We do not have a comment on this." Hopefully, there will be a white console available for the public since its received pretty positive feedback on the forum compared to the initial reception of the black, VCR-looking Xbox One. The black edition comes out November this year and has a price of $499 in the U.S., £429 in the U.K. and $599 in Australia. Is the Xbox One getting a head-start release date over the PS4?